Set up your triangle shade sail anywhere you would like with hardware kit, tree wall or pole, any structure. Turnbuckle- A device for adjusting the tension or length of ropes, cables, tie rods, and other tension systems. Snap Hook- A metal loop with a spring-loaded gate, used to quickly and reversibly connect components. Pad Eye- A flat metal plate with a projecting loop or ring, made all in one piece, providing an attachment point. It is secured by screwing, bolting, or welding it in place. MONEY BACK GUARANTEE We provide you good quality products, in case you are not fully satisfied, please contact us through Amazon. LIMITED TIME PRICING Buy now to take advantage of the limited-time special pricing. Made from premium quality 316 stainless steel, strong and anti-rust. 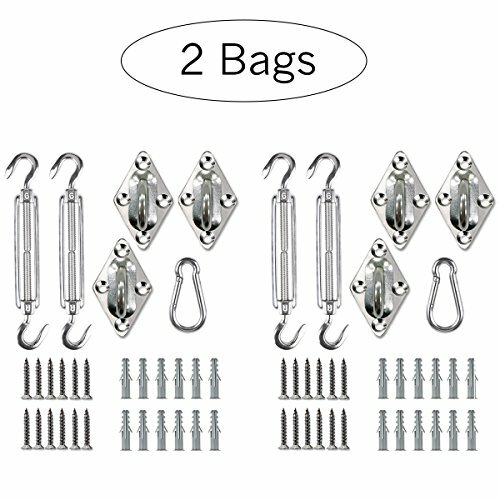 Adjustable turnbuckle to create tension; Length from 6" to 9"
Hardware kit for Triangle sun shade sail installation, make your shade sails more stable. Sun shade sail hardware kit special for outdoor using such as patio, lawn or garden. If you have any questions about this product by Coconut, contact us by completing and submitting the form below. If you are looking for a specif part number, please include it with your message.